The CheckedListBox control gives you all the capability of a list box and also allows you to display a check mark next to the items in the list box. 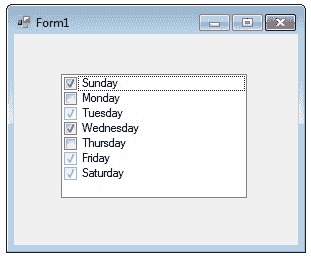 The user can place a check mark by one or more items and the checked items can be navigated with the CheckedListBox.CheckedItemCollection and CheckedListBox.CheckedIndexCollection . 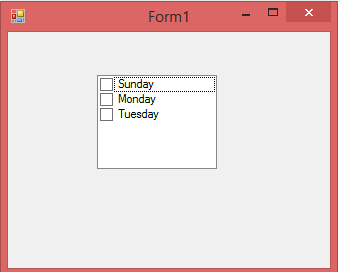 You can add individual items to the list with the Add method . The CheckedListBox object supports three states through the CheckState enumeration: Checked, Indeterminate, and Unchecked. If you want to add objects to the list at run time, assign an array of object references with the AddRange method . 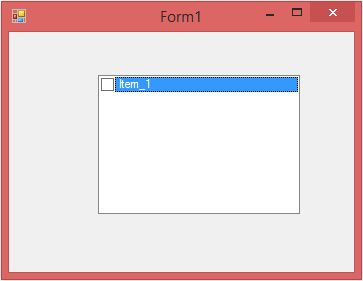 The list then displays the default string value for each object. By default checkedlistbox items are unchecked . If you want to check an item in a Checkedlistbox, you need to call SetItemChecked with the relevant item. 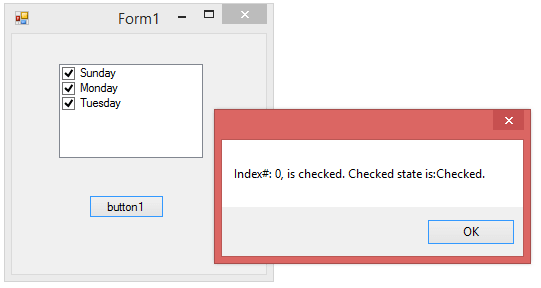 index(Int32) - The index of the item to set the check state for. value(Boolean) - true to set the item as checked; otherwise, false. If you want to set all items in a CheckedListBox to checked, change the value of SetItemChecked method to true. 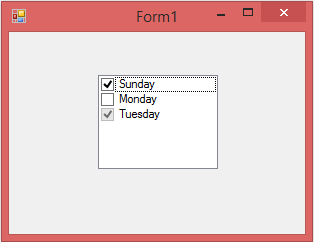 If you want to set all items in a CheckedListBox to unchecked, change the value of SetItemChecked method to false. How to get value of checked item from CheckedListBox? The following example uses the Items property to get the CheckedListBox.ObjectCollection to retrieve the index of an item using the ListBox.ObjectCollection.IndexOf method.